Recent experiments have shown that the upper limit for adult people (without dog allergies or any kind of boundaries) that can be stacked on your OP coordinator's couch for extended periods is three. So, it stands to reason that most of you will want to book a place! Our usual hotel recommendations are still valid. The traditional Viennese Hotel Kärntnerhof offers a good deal (nothing exclusive for us, hotels have contractual obligations now to various online platforms to offer the best possible pricing there, so just use any such platform to book). Also nearby there's the Marc Aurel and the Mercure, and many others. 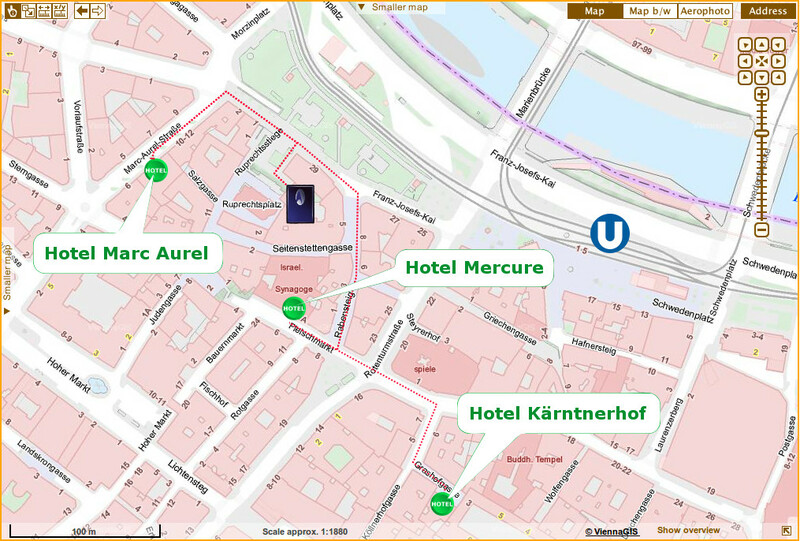 If you're planning to stay further out, there are subway stations for U1 and U4 (Schwedenplatz), and U3 (Stephansplatz), within walking distance of the venue. Any residence near those lines should be fine. However, if you're planning to rent a car in Vienna, we advise against taking the car to the venue. Parking is at a premium in this area. Finally, a word of warning: Airbnb (and similar platforms) have become an extremely popular alternative to hotels. However, Austrian lawmakers are currently discussing a ban (or strict limit) on short-term rentals of private places. Thus, should you choose to book a private place for this summer, keep in mind that there is a small risk they won't be able to legally accommodate you by August.